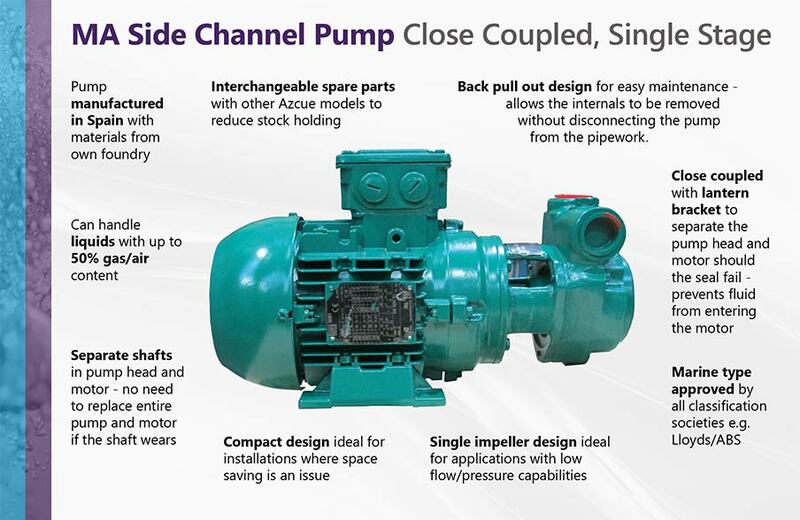 The Azcue MA Close Coupled Side Channel Pump is the entry level side channel pump in the range, with low pressure and flow capabilities because of its single impeller design. This model is usually selected when the flow requirements of the application are too low for the MO, BR and BR-RR. By nature, these liquid ring pumps can handle up to 50% gas content, making the MA side channel pump suitable for applications such as condensate extraction. These Azcue pumps have a separate shaft in the pump head and motor meaning that if one shaft goes, there is no need to replace it all; a benefit over other pumps on the market that have one continuous shaft from head to motor. The Azcue MA horizontal pump has a back pull out design, meaning that the motor can be removed without disconnecting the pump from the pipework, saving time and effort when maintenance is required. Whilst being closed coupled, this liquid ring pump has a lantern bracket, which means that whilst being compact, there is still space between the pump and motor. This means that if the seal wears, no water will fall into the motor. Read our liquid ring pump guide for more information on how this pump works and why it is suited to specific applications.